Since moving to Donegal some eighteen years ago, singer-songwriter and guitarist Ian Smith has become as much a part of the county’s musical landscape as Errigal and Muckish shape the county’s skyline. Beginning in the 1970s, he honed his skills in the folk clubs of his native Scotland, listening to the likes of Archie Fisher, while playing at home the music of James Taylor and Joni Mitchell, Steely Dan and Crosby, Stills, Nash and Young. For a while he even played lead guitar with a rock band called Nessie, but now this debut solo album marks the man from Kilmarnock as a consummate and powerful singer and songwriter in his own right. 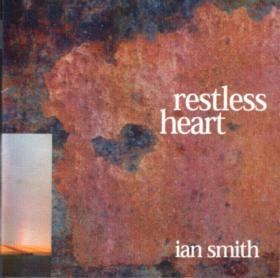 Ten years in the preparation, Restless Heart employs the production skills of Ian’s near neighbour, Capercaillie’s Manus Lunny, to the full and the Capercaillie connection is maintained by the presence of the band’s Donald Shaw, James Mackintosh and Karen Mathieson. There are also guest spots for Ted Ponsonby’s atmospheric dobro, the Japanese harmonica player Hiroshi Yamaguchi and one of Donegal’s best young fiddle players, Stephen Campbell (a man who should be coerced into recording his own solo album), while backing vocals are supplied by Declan O’Rourke and Mags Gallen. Yet, despite the star nature of the supporting cast, this is very much Ian’s own album. Being blessed with a voice that at one moment can bring tears to your eyes and at others bring sweet smiles of delight to your face isn’t simply enough, for what’s needed is the material to match. Ian himself supplies nine of these, another, Big City, is co-written by Bridget O’Boyle and there’s one of James Taylor’s most evocative, Frozen Man. Ian’s own songs paint a broad landscape spanning ecological concerns (Last Call), nostalgic memories (Hometown) and relationships (Kerry and Like a Rainbow), all composed by imaginative brushwork drawing upon his sensitive writing skills. Amply illustrating this are two very different songs, Wounded Land, a sideways look at the way relationships have been damaged by the Troubles in Northern Ireland, and James, an insightful song about fathers and children. An optimist at heart, hope and possibility characterise Ian’s writing, words that should also be applied to his own future career. Already invited over to Nashville to participate in a songwriters’ conventions where his songs evoked considerable interest, there’s plenty of material on Restless Heart to draw the attention of other singers and it’s possible to envisage much slipping neatly into the repertoires of say Mary and Frances Black, Kieran Goss or Tommy Fleming. Thoroughly engaging throughout and bringing new joys with each listening, this is one of the most enjoyable singer-songwriter releases for some time and well worthy of a major distribution deal. This review by Geoff Wallis was originally written for Irish Music magazine (which kindly decided to remove the first paragraph – reinstated here). For more information about Ian contact iansmith1@eircom.net.